or Charlie Baker ’86, one of the most memorable aspects of Kellogg was collaborating with students from varying backgrounds whose perspectives sometimes differed from his own. 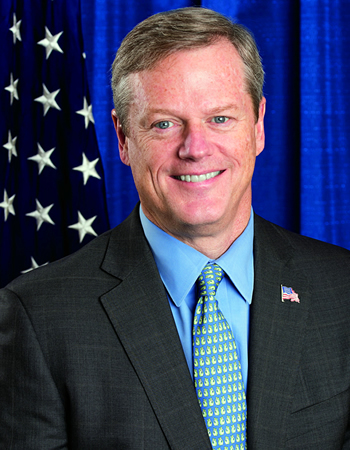 Working well with others remains a reality for Baker: He was elected Massachusetts’ governor in November 2014 as a Republican in a deeply Democratic state. His election came on the heels of a business career that included serving as CEO of Harvard Pil-grim Health Care, a nonprofit health benefits organization. Bay State voters appear satisfied so far with how he’s handling the task. A Suffolk University poll in April showed him with a 74 percent favorability rating and a 70 percent approval rating, higher than that of any other state’s chief executive. “Even for someone in his honeymoon period, that’s a pretty astonishing approval rating,” Tom Jensen, director of the Raleigh, N.C.-based polling firm Public Policy Polling, told The Boston Globe. Baker, who had unsuccessfully challenged Gov. Deval Patrick in 2010, won praise for his handling of the blizzards that buried the Boston area last winter. He says he has tried to pick a few key objectives — including tackling a budget shortfall and improving the state’s aging transportation system — without getting distracted. "Whether you are in the public sector or the private sector, you have got to be pretty good at understanding teams if you want to be successful"
Baker had served under Massachusetts governors William Weld and Paul Cellucci. But he says adjusting his communication style from his business days has been a challenge. Baker says he recommends politics to people in the corporate sector interested in public service, but warns that they should get used to being under a microscope. “Everything you say and do is public fodder,” he says.